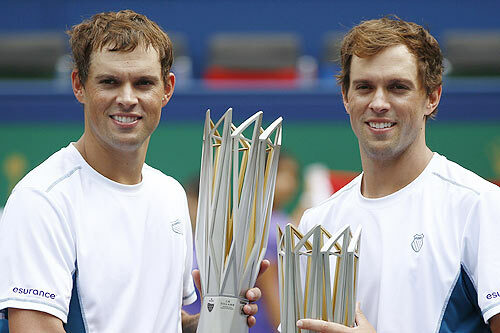 Americans Bob and Mike Bryan, the most successful doubles team in men's tennis history, have pulled out of the defence of their title at the Rio Games saying their family's health is their top priority. "After countless hours of deliberation Mike and I have decided to forego the Rio Olympics," the pair wrote on their Facebook page on Saturday. "Though we'd love to compete again, as husbands and fathers, our family's health is now our top priority." The Bryan brothers are both married and Bob has three children. The pair won Olympic gold at the London 2012 Games and own 112 titles together, including 16 grand slams. "Representing Team USA is one of our proudest tennis moments to date and winning Gold in 2012 will always remain the pinnacle of our career," the brothers added. "The Olympics means so much to us for so many reasons and the memories we have wearing the Stars and Stripes will burn brightly forever. "Thank you to the USTA (United States Tennis Association) for the nomination and to our fans for their unwavering support." Amiable off court, a well-oiled machine on it, the Bryans have carried men's doubles for more than a decade. Ten times they have ended a year as top dogs and have held the number one ranking together for close to 450 weeks in total. They were looking forward to representing their country at a fourth Olympics, having also won bronze in Beijing in 2008, and had planned to play with gold-painted rackets. Bob described their London triumph as the pair's "greatest moment", while Mike said missing out in Athens on their Olympic debut in 2004, when they were expected to medal, was a low. In an interview with Reuters at this year's Wimbledon championships Bob also stressed the importance of the Games. "We know Rio will be our last Olympics, I can safely say that. It's been a huge priority. When we sat down to plan the year in December we said peaking for Rio was the goal. Winning in Rio would mean everything," he said.